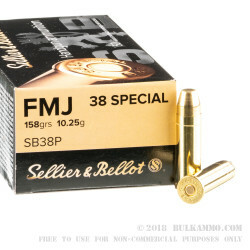 If you're looking for a .38 Special target load that you can shoot indoors, you can't go wrong with this ammunition from Sellier & Bellot. 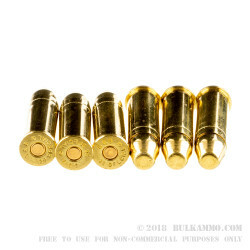 These cartridges fire a 158 grain full metal jacket bullet that produces less fouling than lead round nose bullets, as well as reduced heavy metal exposure. With a muzzle velocity of 889 feet per second, this is a medium-power load that will produce more recoil than mild target ammo, and serves well as a stand-in for more powerful defensive hollow points. 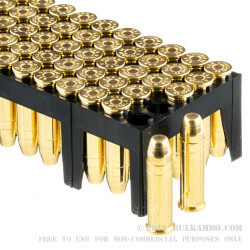 Each box contains 50 rounds. 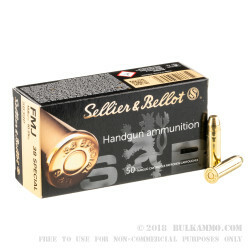 Sellier & Bellot ammunition is loaded in the Czech Republic using non-corrosive Boxer primers and reloadable brass cases.